Shock horror! There are only 45 days until Christmas and as always I need inspiration for both big presents and stocking fillers. In our house, we do stockings first thing in the morning and big presents later on in the day. With great timing, Wicked Vision has sent me three products – in the stocking fillers price range – to review. 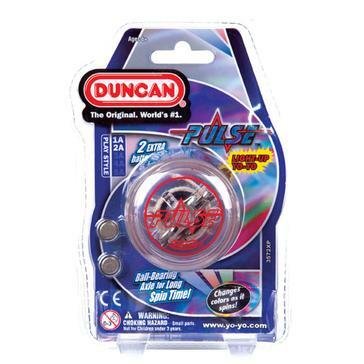 First up is The Duncan Pulse Yo-Yo priced at £10 (Duncan claim to be the original and number one yo-yo brand). 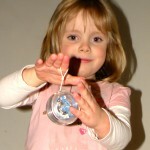 It’s a light-up yo-yo so looks cool and instantly got Sofia’s interest (who is nearly five) despite being recommended for six years plus. The great thing is, it comes with batteries already installed and better still, it comes with replacement batteries. It’s well made and the blurb reliably informs that it is a perfectly balanced, ball-bearing yo-yo. It certainly seems a lot smoother and slicker, and not the tangled mess I remember yo-yos being from my playground days. so here’s a pack shot. Sofia couldn’t do the tricks but the slick movement coupled with the light and colour made it a big hit. My two-year-old twins were mesmerised by changing colours and loved watching their big sister play with it. 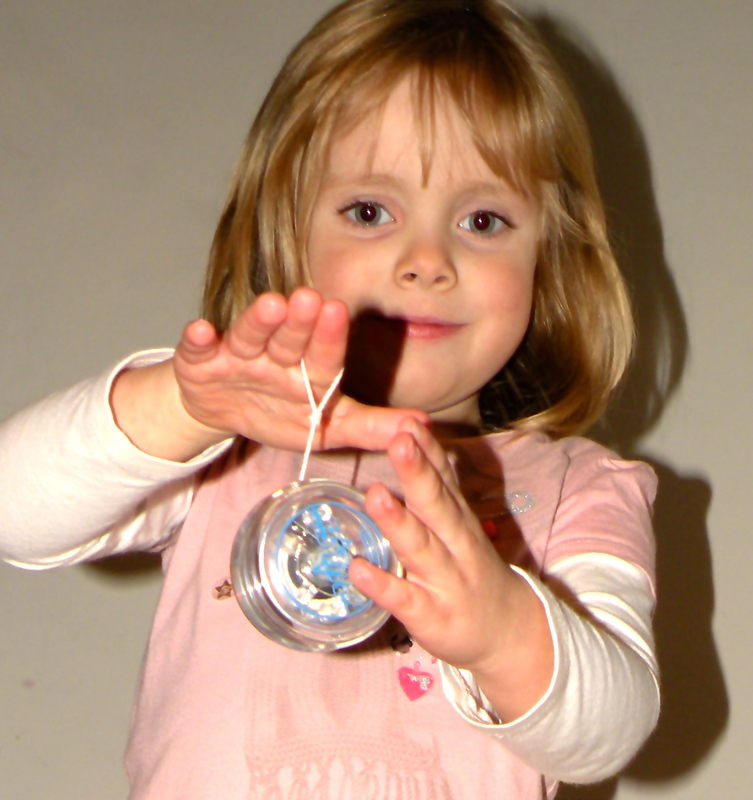 They were very entertained minus the tricks, so this would definitely be a winner for those with a bit more skill. 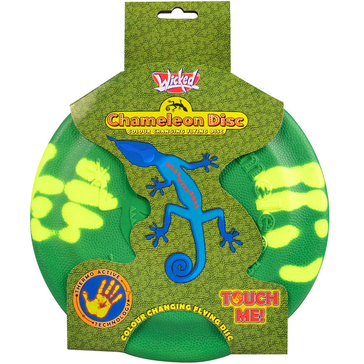 The Chameleon Flying Disc (£6) is a Frisbee with a thermo active technology twist, meaning it changes colour with just the heat of your hands. I have to say, I can’t enthuse too much about Frisbees in general, but the kids liked it, and whilst it doesn’t change colour quite as dramatically as the website picture shows, it did noticeably alter when they touched it, which they enjoyed. 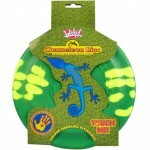 I like the fact that it is made of soft foam so can be used indoors – as well as outdoors – safely. It comes in four different colours. It says suitable from three years but, at two, the twins were more than capable of chucking it, and the textured surface made it much easier for them all to grip (and even catch – sometimes!). 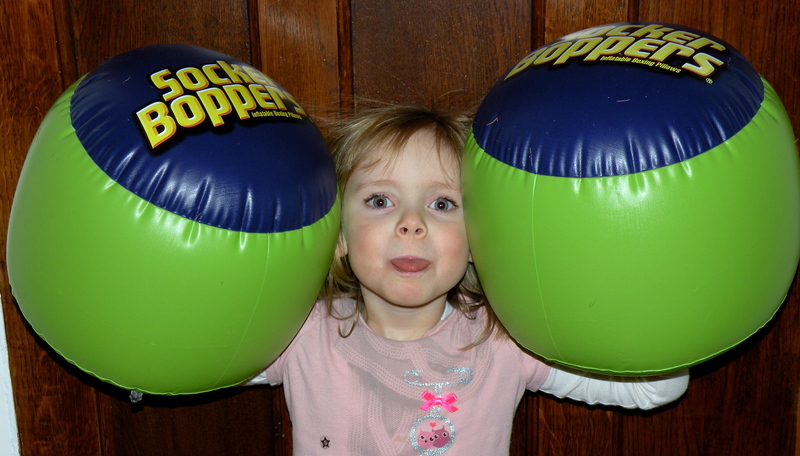 Wicked Socker Boppers are inflatable boxing pillows (£10). I initially had mixed feelings about these, as I wasn’t sure I should be encouraging my eldest daughter to box. However, they are fantastic fun and all three girls absolutely love them; I love them! In my opinion they are safe, but certainly require proper supervision. They are very padded, featuring a ‘double cavity air chamber’, which provides extra cushioning. All four of us could comfortably get our hands into the gloves and even the two-year-olds could bop without them falling off. They are made from heavy-duty vinyl and have taken quite a pounding without any hint of a puncture, but they do come with one repair patch just in case. They have also stayed fully inflated for the week we’ve had them, and Sofia was able to blow them up herself without any help. There are only two soccer boppers in a pack; it would be a lot more fun to have two sets so you can have a proper little spar. I must say Fran these toys sound expensive to be “stocking fillers”. That totals £26 for 3 items. I am obviously becoming older as I feel that we spend far too much at Christmas. As we are with you this year I for one will not be going out and getting a real tree for £50 plus like I normally do. It does look lovely when decorated but really Christmas should be celebrated over 2 days not a whole month or more!!! I suppose it is very subjective. I viewed them as stocking fillers, but maybe a lot of people would agree with you. Interesting question actually: How much do people spend on stocking fillers? We do pressies from us in the stocking/bedroom done first thing and pressies from the rest of the family/friends under the tree, just like I did with my folks! Stocking fillers this end are hama bead boards (around £5 for 3), tubs of beads to go with it, some DVD’s, sweets, books, and some clothes. Medium is usually clothes/shoes, lego, and toys that accompany the ‘big’ pressie – fewer of these though. Large is usually (in an all pink household) something big and only one of them that is over £40/£50 – this year its Barbie and Sofia the First for Lyra & Hattie! Beatrix is harder, but as I get through toys fairly quickly childminding, she may get a trike as the boys I mind have just broke hers! Thanks so much for the comment Hannah. It’s great to hear other peoples’ accounts. I guess I viewed these as stocking fillers as they were £6-£10. We have books and chocs too in ours, and mainly things that are around the £5 mark. My brother and I didn’t have stockings, we just had medium and big presents. My mum never spent a bean on herself all year round and then used to go absolutely crazy at Christmas on us two (actually quite surprised we are not totally spoilt now!). When I was young, we never put the Christmas tree and decs up until after December 10th (my birthday). My mum didn’t like to confuse the two things. So, even now, we put the Christmas tree up some point soon after the 10th. It gives enough lead in without feeling OTT. It definitely comes down by the 6th Jan. After Boxing Day I start to feel a bit depressed about seeing the tree and decs still up as the anticipation has obviously gone. Totally agree with you Jean that its all to early and too commercial in the shops, drives me batty when you see Christmas Chocolate for sale in August, and its expiry is in the November!? I made the girls their sacks (www.facebook.com/finderskeepersrossett – in the Christmas album) and charged £20-£25 each for them but they are huge & a lot of work! They are lovely Hannah. I can quite see why they would be priced at £20-£25. I can appreciate Hannah’s thoughts and certainly admit when the boys were little obviously Christmas was longer than 2 days. Our tree would go up a week before Christmas along with all the other decorations. Then down by the 6th. I had a pillowcase as a child and this carried on with the 3 lads. Only small silly items in the pillowcase then presents from under the tree about 11a.m with a cup of coffee. I did take the kids to Christingle services or an afternoon Christmas Eve service. Now I attend Salisbury Cathedral Christmas service, which is lovely, the Sunday before Christmas Day. It is all the adverts and commercialism that appears sooo early now that I object to. It seems we are missing the point of this time of year.